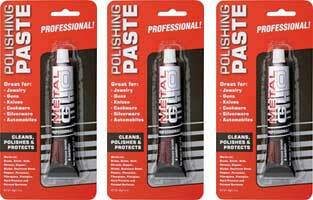 Blade Polishing Paste for sale is a popular cleaning solution for polishing swords. Metal Glo Blade Polishing Paste is a formulation of aluminum oxide that is used for polishing stainless steel, brass, silver, chrome, copper, carbon steel and a variety of other metals. This set contains three individual 1.75 oz tubes. The paste can also be used for cleaning and polishing most other metal surfaces. Buy the Metal Glo Blade Polishing Paste for general sword maintenance and to clean all types of blades, knives and swords for $14.99.